A team of Obama loyalists inside the DOJ and the FBI try to prevent a government takeover by wiretapping the presidential campaign of the Orange Monster. The Orange Monster replaces the first black president in the Oval Office. Season 1: Obama transforms America with his phone and his pen. Season 2: The Orange Monster comes and erases Season 1. 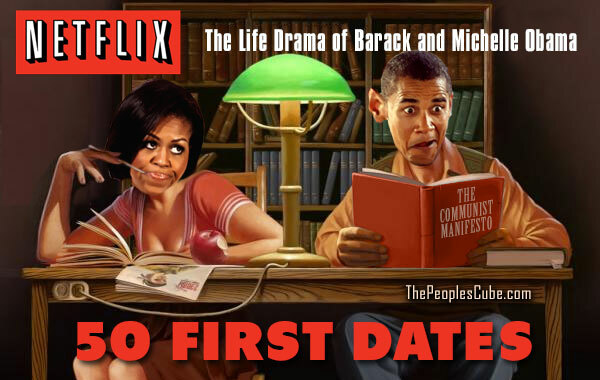 The life and times of Barack and Michelle Obama. Professional tips on community organizing from the masters of trade. Barack and Michelle go on magical adventures, learning about the wonders of Global Warming, lowering the sea levels, and making up fun scientific facts across a variety of locations and time periods. Barack and Michelle Obama are two KGB spies in an arranged marriage who are posing as Americans in Washington, D.C., shortly after he is elected president. We're better than you and you know it. So kick back, eat your kale, and watch us party like there's no tomorrow. When we run out of food, we'll blame the Republicans. It doesn't matter if they actually do the show or not. The important thing is to launder some of his share of those pallets of untraceable cash to him so he can enjoy what he earned. I am disappointed. Cash for Clunkers must have ended up on the cutting room floor. The "One and a Half Men" picture is today's featured cartoon on the American Thinker. It has 74 comments so far, and a lot of them are made by prog-trolls. I noticed that any time proggism is hit into a sensitive spot on the net, trolls converge on it like flies, as if on command. I'm told that Center for American Progress (founded by ‎John Podesta) has a room full of employed trolls who do it all day for money. Very similar to the Russian troll factory, but no one writes about this one. I wonder which one came first and which one is an imitation. The tactics are very similar. This was happening to me before, on PJ Media. The more hard-hitting the story was, the more trolls were depositing their poop in the comments, trying to mitigate the damage. It's always too organized to be a coincidence. Ian Fleming was a bad speller. Expect 007 to sneak into this thread and covertly replace the "acion" picture with the "action" picture. Mr. Fleming has asked for my assistance in this matter. Thank you, comrade Solicitor I. Wood Tapdat. You come here often? Sir, I only come here for the babes. Looking for something else on the Cube I just discovered a hidden treasure trove from 2012 - for some reason, the hashtag #ObamaTVShows was trending on Twitter, and we took part in the game. In an attempt to be less criminal and less damaging to America, they produce and sell meth. Killary Pinkman dissolves their enemies in barrels of acid. Should Netflix change its name to Redflix? Obama Nation the movie: who will play Barack and Michelle? Michelle Obama in Prison - FREE MICHELLE!